Apart from being pestered by a noisy, nosey neighbor, there is nothing more annoying than being plagued by a swarm of malicious, malevolent mosquitos and flies when fishing, crabbing, clamming, et cetera. Before I go any further, lest I be accused of being a cranky old man, I should make it quite clear that neither Donna nor I ever suffered the likes of a noisy, nosey neighbor. 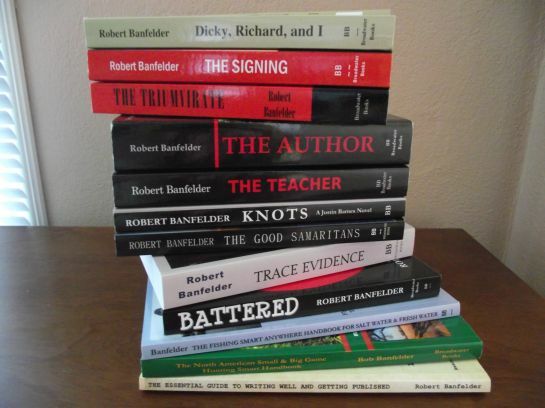 Yes, we lead a charmed life, for we've always had fantastic neighbors. What we have endured, however, from Gananoque to Punta Gorda, are teems of pesky winged insects that could ruin your day while fly-fishing a favorite pond, angling for bass on a backwater or bay, or bowfishing a lazy river. 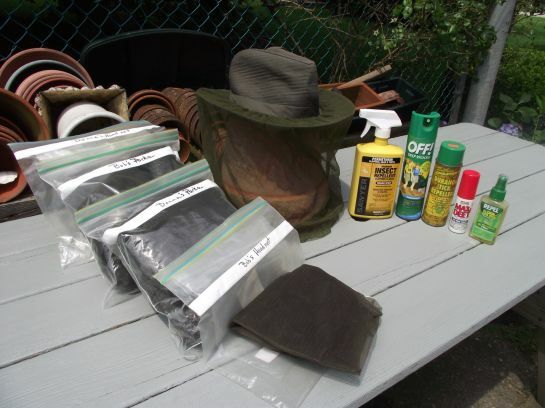 Through the years, Donna and I have carried head, face, and hand protection, either in the form of a netting material and/or malodorous insect repellent sprays for clothing, skin, and gear, especially chemicals containing high percentages of DEET (diethyltoluamide, a.k.a. N, N-Diethyl-meta-toluamide). Due to concerns of toxicity, over the course of years, many folks have switched to DEET-free insect repellents, which in all honesty are far less effective than repellents containing DEET and another active ingredient, Permethrin. You would have to seek out DEET-free plant-based repellents containing active ingredients such as oil of lemon eucalyptus for the repellent to be time effective (measured in terms of minutes rather than hours), regardless of a manufacturer's claims. There were those early mornings and evenings while pike fishing in Ontario, Canada that Donna and I would slather on insect repellent containing such active ingredients in addition to donning mesh netting apparel, too. Thank goodness we can finish up our years on the water (hope there are still many of them ahead) by using hands free, state-of-the art, heat activated, mosquito repellent technology. Thermacell is hassle-free and so much more effective than having to deal with all those messy chemicals and outerwear. 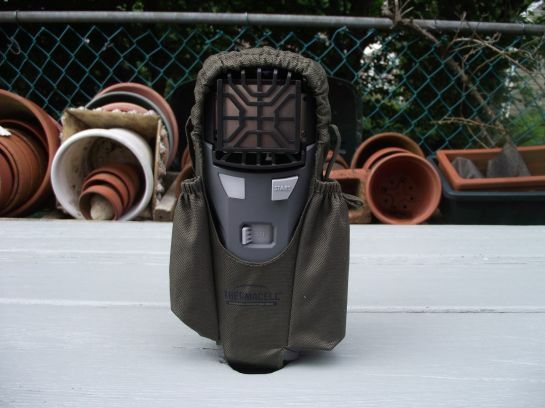 Thermacell Mosquito Repellent MR450 Unit. The beauty of the Thermacell MR450 unit is that it covers a 15 foot x 15 foot zone of protection, creating a barrier against mosquitoes and flies. No longer is it necessary for Donna and me to tote duplicate sets of mesh head nets, parkas, pairs of fingerless fishing gloves, nor messy chemicals applied to skin and clothing as shown. Left to Right: Bug-Out Outdoorwear ~ Mesh Head Nets ~ Mesh Jackets (Parka-style design); L.L. Bean Mesh Hat/Head ~ assortment of insect repellents. Thermacell Mosquito Repellent's blue heat mats are activated by a butane cartridge, releasing the insect repellent into the air (active ingredient: d-cis/trans allethrin 21.97%). The repellent is a synthetic copy of a natural insect repellent found in chrysanthemum plants. Thermacell MR450 Mosquito Repellent Product: unit, case, butane cartridge, mosquito repellent mat. I don't want to be bugged when I'm fishing or hunting. 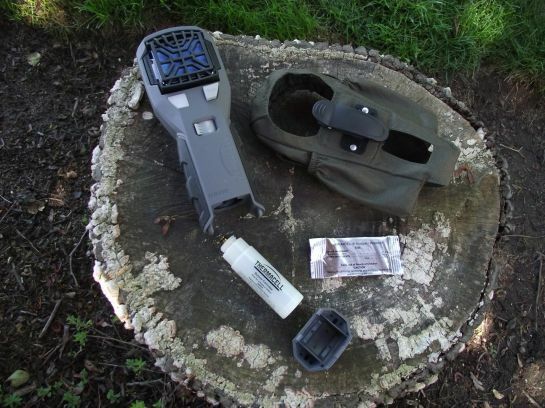 Therefore, the Thermacell MR450 Mosquito Repellent product is a piece of equipment seriously worth considering. A fair question of concern is the unit's effectiveness. A candid response is that it depends on whether or not there is a significant breeze to negate or limit its efficiency. In a calm setting, the unit works remarkably well, covering a 15 x 15-foot radius as advertised. To counter its limited effectiveness in a moderate wind, I spray my hat (not my skin) with OFF! Deep Woods insect repellent, which contains 25% Deet, or Repel Lemon Eucalyptus (Deet-free) repellent. Among these controls, I'm good to go. To keep my hands from being bitten up on extremely buggy days when angling, I also don a light pair of Dr. Shade 100% nylon fingerless fishing gloves; they offer UV protection as well. Also, I lightly spray the backs of the gloves (not my hands) with one of these repellents. Keep in mind that Thermacell's heat-activated mats are both Deet free and virtually scent free. I have field-tested the item for well over a year; Donna and I have never had an issue with this fine product. Although the unit has belt clips for convenient carry, I do not wear the item when angling, hunting, bowfishing, or lounging around a deck or patio. For best results, I position the Thermacell unit horizontally upon a convenient surface several feet away from food and beverage. While relaxing on our back deck or neighbor's patio on a calm evening, this single unit has taken the place of a circular parade of citronella bucket candles. The unit provides 4 hours of protection before having to change the blue mat, which is placed behind the unit's protective screen. This is done in a matter of seconds. Simply slide in a new mat while pushing out the old. The butane cartridge is good for activating three mats; hence, you have 12 hours of protection before having to insert a new cartridge. Get out out there and enjoy your bug-free outdoor activities with a Thermacell product. For their complete line, Google www.thermacell.com.